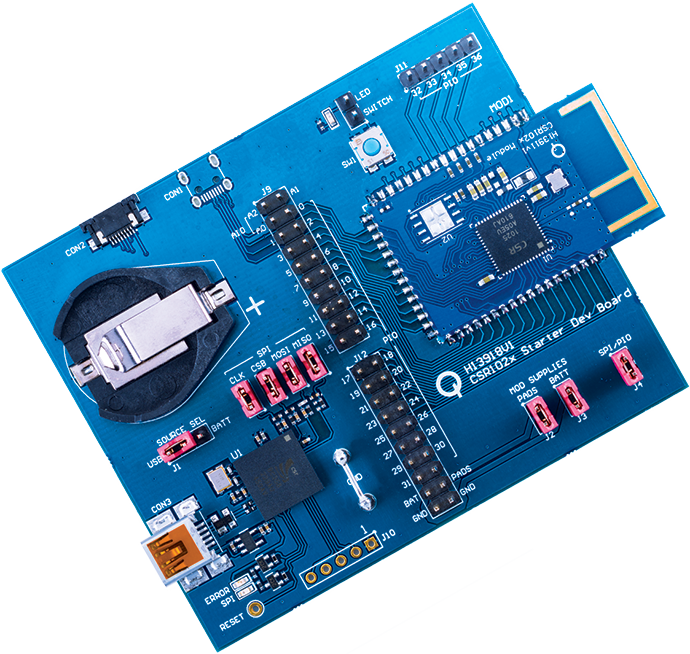 The CSR102x Starter Development Kit (Part #: DK-CSR1025-10285) is an affordable and comprehensive development kit targeted toward developers, engineers and enthusiasts to help reduce prototyping and development time for Bluetooth Smart concepts and prototypes using production quality toolchains. Multiple turnkey applications that have been fully documented and stress tested are included with this kit, permitting significantly reduced time and resources required to turn concepts into working prototypes This helps provide detailed customization while significantly reducing time-to-market. Target board with Bluetooth low energy SoC on reference module, USB programming interface and interfaces for breaking out I/O to application-specific sensors and actuators. The target board can be powered either from the host USB connection or can be configured to run standalone from an on-board coin cell (not included). The design of the board also includes provision to easily permit accurate full system power measurements to be made. The target board included in the Starter Development Kit is ideal for a tag application as it includes a button and LED. But it also includes expansion connectors which could be used to support an external flash device or additional PIO. Additional example application boards are available that can be fitted to the breakout pins including the Smart Remote Application Board and Sports Watch Application Board.